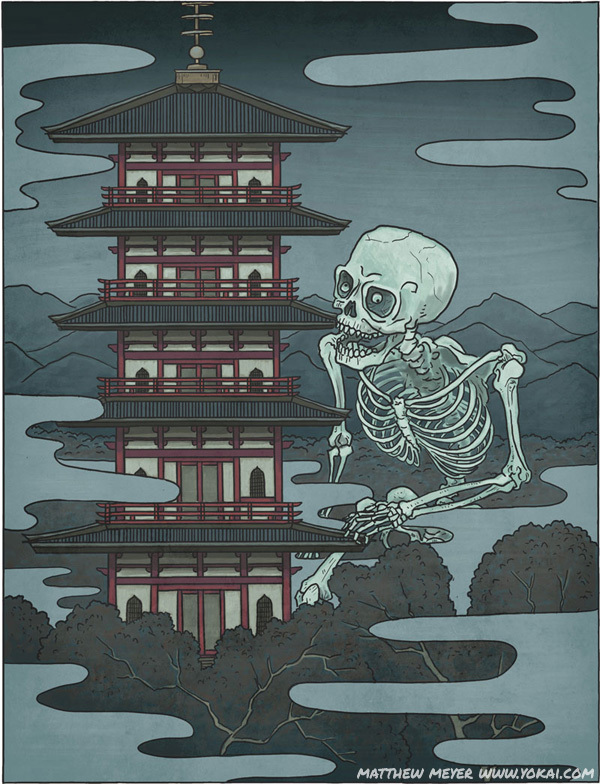 APPEARANCE: Gashadokuro are skeletal giants which wander around the countryside in the darkest hours of the night. 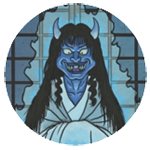 Their teeth chatter and bones rattle with a “gachi gachi” sound, which is this yokai’s namesake. If they should happen upon a human out late on the roads, the gashadokuro will silently creep up and catch their victims, crushing them in their hands or biting off their head. ORIGIN: Soldiers whose bodies rot in the fields and victims of famine who die unknown in the wilderness rarely receive proper funerary rites. Unable to pass on, their souls are reborn as hungry ghosts, longing eternally for that which they once had. These people die with anger and pain in their hearts, and that energy remains long after their flesh has rotted from their bones. As their bodies decay, their anger ferments into a powerful force – a grudge against the living – and this grudge is what twists them into a supernatural force. When the bones of hundreds of victims gather together into one mass, they can form the humongous skeletal monster known as the gashadokuro. LEGENDS: The earliest record of a gashadokuro goes back over 1000 years to a bloody rebellion against the central government by a samurai named Taira no Masakado. His daughter, Takiyasha-hime, was a famous sorceress. When Masako was eventually killed for his revolt, his daughter continued his cause. 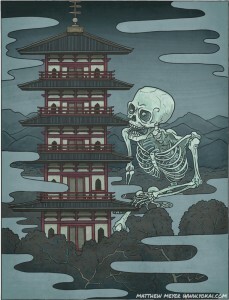 Using her black magic, she summoned a great skeleton to attack the city of Kyoto. Her monster is depicted in a famous print by Utagawa Kuniyoshi.